Photo by Tylir Penton Photography. School is back in session, and the leaves are starting to turn. It’s fall, which means it’s officially been a year since both Puck and Swagger entered their working lives with me. 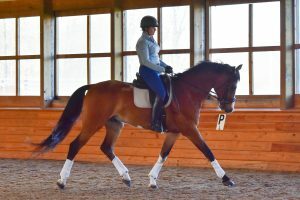 I’ve always believed it takes a year to get to really know any new horse, trained or prospect; then add in to the mix the fact that young horses are constantly evolving, and really knowing them as individuals is an ongoing proposition. But I’m very confident in my lay of Puck’s land now. In the beginning, he was a pretty colossal jerk, with a teenage anger management issue combined with 17.2 hands of enthusiasm that moved and accepted the aids (or not) like a bull in a china shop. Puck’s approach to life was to just power through everything, usually by grabbing the bit and bearing down on it with all his might, and if I was successful in getting a word in edgewise, he’d get mad and hit the brakes. It made for an exciting first few months. And with any new horse, you don’t really know how far they’ll take their disruptive behavior until you’ve lived with it a while. I had a horse screw up my confidence pretty badly a while back, and I’m not a kid anymore either, so I didn’t totally trust him for a while. Over the winter, he started to let me in. And then we went to a few shows this spring as a non-compete, where he really reverted to his bad boy ways off property, and I started to worry. But in late May, something changed; all of a sudden he wasn’t so angry. He’d let me apply and remove pressure. He became willing to try life just outside of his comfort zone, and more than that he became able to make a mistake and not get pissed as a result.